In a world that's more than ever connected, sometimes we feel the need to know what other individuals from different background think about a specific subject. 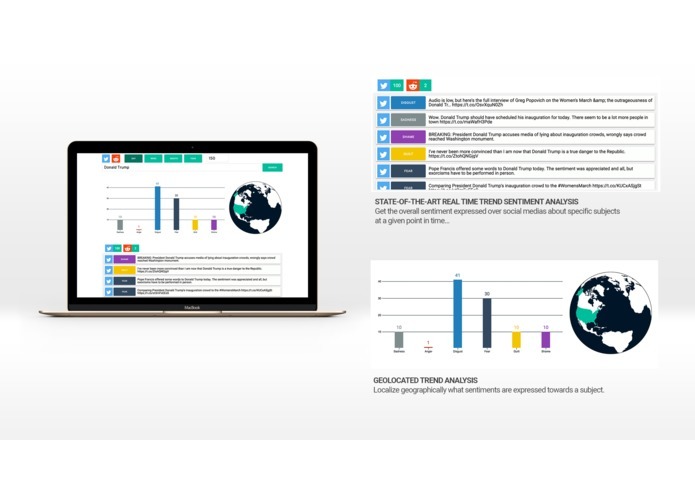 SocialSurvey allows you to query an aggregated set of social media posts in order to get the portrait of the general sentiment towards a topic. Our stack is primarily based on Nuance's NLU API. NES was used to train a custom model from annotated sentences of various sources. Our training dataset consisted of 40,000+ annotated samples and varies from social media posts to general consumer reviews. Firstly, we mine twitter and redit for posts or comments related to the searched topic(s). Our model is then used to extract the expressed sentiment along with a confidence number. Results are aggregated and sent in a streaming fashion to the client using web sockets. This allowed us to build a beautiful visualization tool that updates smoothly every time a result hits, enhancing the overall user experience and usability of our tool. Data is displayed in a bar chart, each bar being a specific sentiment. As we also geo-locate posts, we offer an interactive world globe showing the countries where the data originates from. I mostly worked on the NodeJS backend that fetches posts on our providers and communicates with Nuance to extract the sentiment for messages. I also created the python tool that allowed us to import our rather large dataset directly in the NES console. I've worked on the frontend creating everything but the charts.